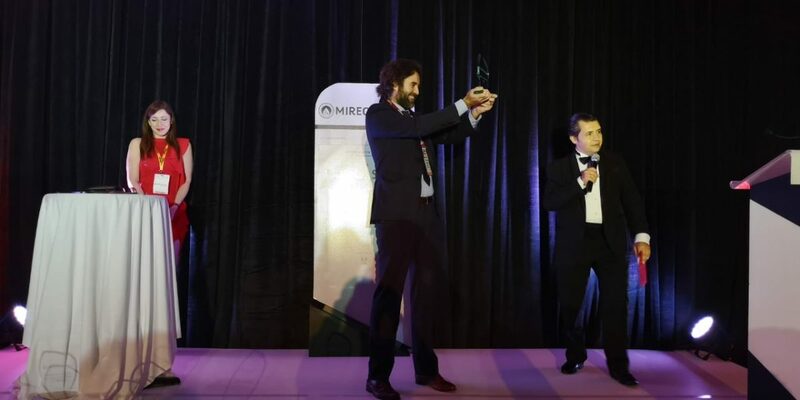 Yesterday, May 22nd, Gransolar Group obtained the MIREC Award for “Breakthrough Company of 2018” in Mexico City, a category in which Neoen and Energía Libre were the other nominees. The awards ceremony is part of MIREC Week, the largest renewable energy congress in Mexico, which is attended by 1,800 professionals. Francisco García, Country Manager of Gransolar Group in Mexico, received the award. “I would like to thank the organization and everyone who is here”, he said in his speech. “We want to dedicate this award to all the people who are part of the group in more than 17 countries, and especially to the ones who are working in Spain, who are far away but have made this real”. The visitors of the MIREC Awards website decided this outcome with their votes. Gransolar Group would like to thank everyone who voted for its “Breakthrough Company” nomination and made it possible. It is a very valuable recognition in Mexico, a market in which Gransolar Group has been a pioneer and has experienced an enormous growth. After only four years of operations in this country, the projects by Gransolar Group in Mexico already add up to almost 200 MW, and it is among the leaders in solar energy. An even bigger growth is expected for Gransolar Group in Mexico, and that is why they moved to bigger and better located headquarters in the capital city.